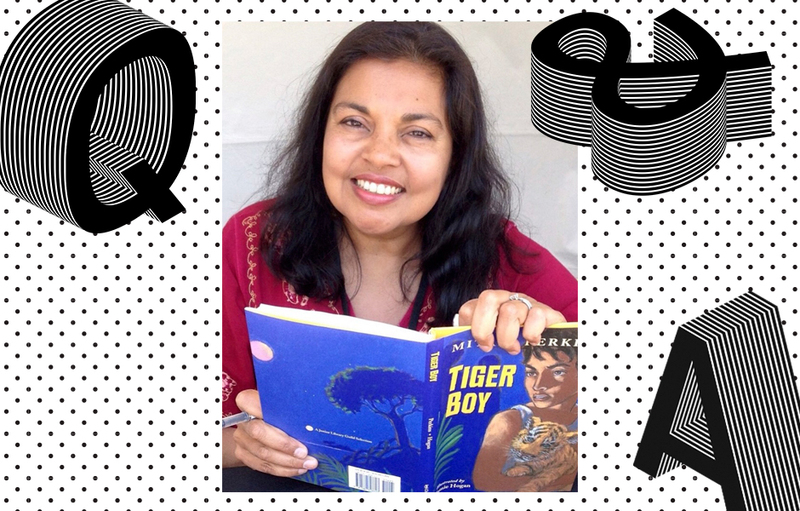 We caught up with Mitali to discuss her writing process, libraries, and the joy that comes with hearing one’s own work on audio. Tell us about your audiobook. Forward Me Back to You is an exploration of how it’s possible for us to move forward with hope and healing despite trauma in our past. Good friendships are a big part of that journey. Here’s the official blurb: Katina King is the reigning teen jujitsu champion of Northern California, but she’s having trouble fighting off the secrets in her past. Robin Thornton was adopted from an orphanage in Kolkata, India and is reluctant to take on his future. Since he knows nothing about his past, how is he supposed to figure out what comes next? Robin and Kat meet in the most unlikely of places — a summer service trip to India to work with survivors of human trafficking. As bonds blossom between the travel-mates, Robin and Kat discover the healing superpowers of friendship. I’ve always been a writer—I have diaries from when I was 8 or 9. I scribbled thoughts, prayers, poems, and stories. But I never dreamed of “author” as a full-time career. My parents were first refugees and then immigrants. They worked hard and sacrificed greatly so that their children could thrive here in the United States. Thanks to them, all three of us received the gift of a great education. They wanted us to have easier lives than they did. That’s probably why a career as an author wasn’t on their top ten list when it came to stable, lucrative jobs, and so I pursued public policy and teaching. Still, I kept writing–poems, prayers, stories. I couldn’t stop. And I kept sensing deep inside that writing was the way I was designed to serve the planet. To my amazement, my first novel (The Sunita Experiment), which I wrote for fun while working full-time as a visiting professor, won a contest and was published. What joy! And then, my second novel (Monsoon Summer), after being rejected by 22 editors over 10 years, finally was accepted. That’s when I decided it was time to be all in as a full-time author, and I haven’t looked back. And oh, how proud and delighted my parents are! Just peruse my Mom’s facebook page–it’s basically a Mitali Perkins fan page. What’s the most challenging character you’ve written and why were they a challenge? Writing Ravi in Forward Me Back to You was heartbreaking. Our twins are internationally adopted from India, so putting myself in Ravi’s skin meant seeking to understand more deeply the trauma and loss that takes place when a first mother relinquishes her baby. I poured much of my love for our sons into this novel. They are adults now, and when I asked if I could create this character and write this story, they responded: “We trust you, Mom.” Oh, how I hope and pray that I have lived up to that trust. Is there a certain book, movie, or author that’s been influential for you? I re-read my old favorites every year. When you read a book more than a dozen times, that story carves its way deep into your soul. Everything about it will influence you–from deep themes to the intricacies of craft. That list of novels I read annually is short, and almost all of the authors on it are dead (except for J.K. Rowling and Susan Howatch): Maud Hart Lovelace, L.M. Montgomery, Frances Hodgson Burnett, C.S. Lewis, J.R.R. Tolkien, Elizabeth Enright, Lenora Mattingly Weber, Sydney Taylor, Virginia Sorenson, E. Nesbit … Well, maybe it’s not that short! Has the experience of listening to your audiobooks revealed something about your work that you didn’t expect? If so, what? It’s so hard to read my own work. I see so many flaws and tweaks I wish I could make. At times I despair that I’ll never improve when it comes to craft. But as I listen to them on audio narrated by a brilliant voice actor, something miraculous happens: an audiobook provides me with the distance I need to take the story in as a reader. And one marvelous outcome is that it builds my confidence. “Hey, this is GOOD!” I sometimes think as I listen. Or I laugh and cry, which I never do when reading my books. Truly, it’s a gift. What’s your favorite library memory OR what do you love most about libraries? When we first arrived in the United States, I was seven years old. I was already an avid reader, but books were scarce in our house as money was tight. The first Saturday we were in Flushing, Queens, my sister Sonali took my by the hand and we walked the eight blocks to the public library. “You girls may each take seven books home with you,” the librarian told us, smiling at the wonder in our faces. Sonali headed off to the teen books section while I browsed the shelves and shelves of children’s books. It seemed like Ali Baba’s cave of treasures to me. As far back as I can remember, stories have always been my go-to de-stresser and libraries have been the source of that solace. Even when I was a student at University, I’d sneak off campus during final exams week and head straight to the local public library for a fix of my favorite stories.